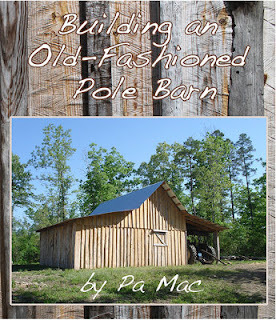 Getting our hands on a copy of Pa Mac's Building an Old-Fashioned Pole Barn was extremely timely, especially since we finally seem to have settled on a goat barn plan. Dan is in the beginning stages of technical planning and so was very interested in this book. Are ya'll familiar with Pa Mac? 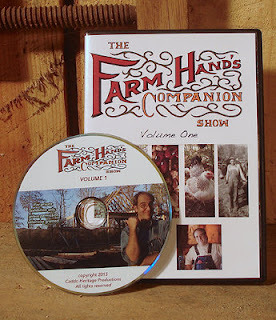 His website is Farm Hand's Companion, where he focuses on sharing the how-tos of traditional farming skills. This book definitely fulfills that mission statement. It is complete, clear, and concise, with a wonderful touch of down-home humor. 107 photographs are keyed to text, to further clarify the steps involved. The book is 8.5" by 11" with 63 pages. It is well priced at $15. "Pa Mac takes an undeveloped tract of land and begins to turn it into a traditional subsistence farm." For those of us who are visual learners, it contains episodes that put the building of the pole barn in motion, from clearing the ground to unique finishing touches. Overall the DVD is an interesting look at building a subsistence farm from scratch and utilizing the natural resources at hand: the episodes on various types of trees and their uses, how to make lumber, how to plant heirloom apple trees, what to do with all those rocks around the place (hint - think floor), and a clever log chicken house. And don't miss the special features. 12 episodes, 151 minutes, priced at $20. You'll find both of these in the Farm Hand's Companion General Store. Though im not planning to return to the land in the near future, i love watching these programs. Such resourcefulness and a goodly display of good ole hard work, common sense and morality. What a great resource. We have built a couple of sheds on our place. The nicest one also serves as a cross tie for the horses and has a loft. I did put apple cider vinegar in my bone broth, but I didn't realize that's what it did! I just read to add it online. I hope resources like this will lead to a resurgence of old style pole barns instead of their metal clad modern cousins. I've seen this ~ it's great! He has a bit of a sense of humor too. Neat. Never heard of him or these before I will check em out. Thanks!!! I hope that you're able to get your new barn soon. It's interesting to see that practical wisdom put to good use. I picked up a number of good tips. Now you know you did real good with your broth! :) Do you have blog posts about your sheds? I'll have to go take a look. We're busy collecting all the ideas and information we can get. The metal ones don't even look like real barns. More like warehouses! Definitely. It comes through in the book but especially the video. I found myself smiling and chuckling right along. I love the whole Pa Mac video series! It's really great stuff. So glad to see you have kept up your blog and are doing well. We don't get around to visit as much as we used to but you are still in our bookmark list. I hope he continues to make more of them. There is a wealth of information about skills that are nearly lost. We need to save those. Okay, I wrote a comment and lost it. (I think)! Anyhow, I looked at Pa Mac's website. It is great! I need several free days to read all of your posts and now some of his. :) You inspire me to do more on our 5 acres. Thank you! There is so much good stuff out there and I appreciate being on your list of good stuff!